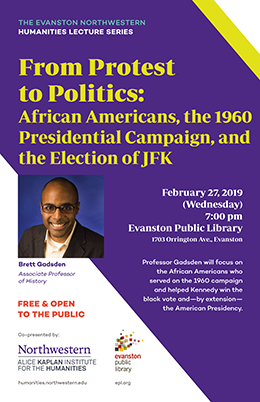 Co-presented by the Evanston Public Library and Kaplan Humanities Institute, Northwestern faculty share and discuss their research with the public in casual evening lectures at the Evanston Public Library, 1703 Orrington Avenue, Evanston. Free and public welcome! 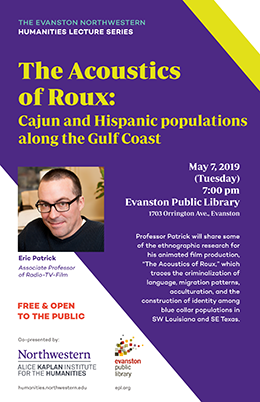 Eric Patrick will introduce some of the ethnographic research that has gone into the creation of his current animated film production The Acoustics of Roux. The film traces the criminalization of language, migration patterns, acculturation, and the construction of identity among blue collar populations in SW Louisiana and SE Texas. Brett will focus on the African Americans who served on the 1960 campaign and helped Kennedy win the black vote and—by extension—the American Presidency. Brett Gadsden and Eric Patrick are 2018-19 Faculty Fellows of the Kaplan Humanities Institute.